It is hard to think of a more challenging problem: How do you distribute necessary medicines in a developing country lacking infrastructure? That is question tackled by Simon and Jane Berry, two Brits trying to reduce childhood deaths from diarrhea in Africa. Diarrhea is the leading cause of death for children under five — which is tragic since it is not some mysterious disease. It is completely treatable by standard and (in the grand scheme of things) cheap medicines. But you need to get the medicines out to rural areas. The Berry’s solution was a packaging innovation that lets them piggyback on existing, super efficient supply chain. Whose supply chain? Here’s a hint, their not-for-profit is called ColaLife (ColaLife: Turning profits into healthy babies, BBC, Jul 22). Simon Berry and his wife Jane had come up with a strikingly-simple idea – a package for medicine that slotted into the empty space at the top of a crate of soft drink bottles, fitting neatly in between the bottlenecks. A dazzling idea, to piggyback the delivery of the diarrhoea medicine for babies onto one of the most efficient distribution systems in the world. 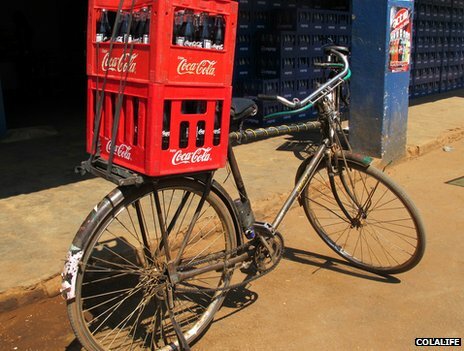 Go anywhere and you will find a shop selling Coca-Cola. And the plastic packaging is ingenious – once opened it becomes a measuring device. 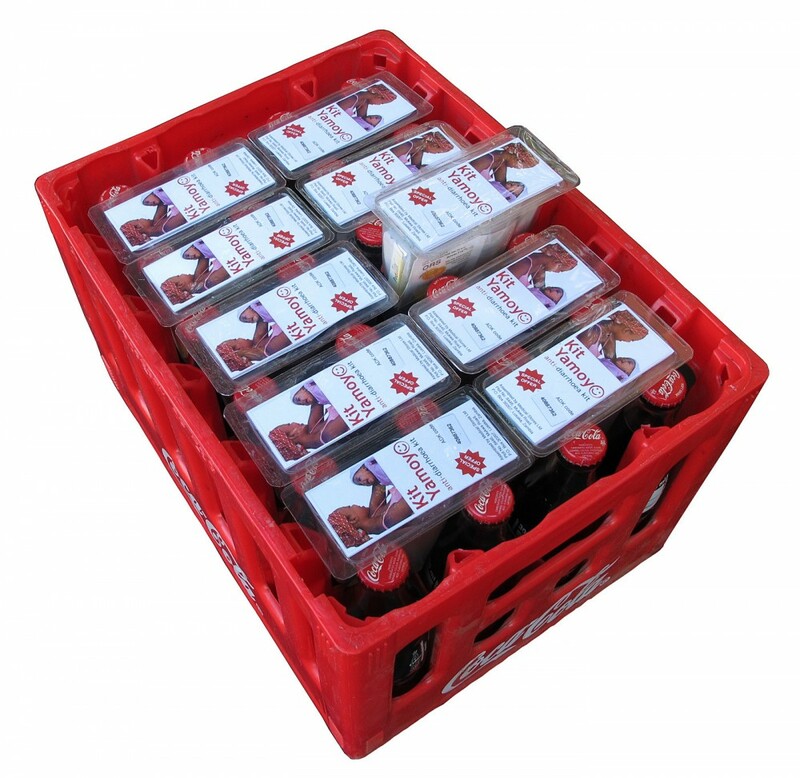 Here is what ColaLife’s anti-diarrheal kits look like sitting in the crates. Here is how the crates get out to villages. So how many different radiator models does a global car company need? Clearly it needs enough to accommodate different sized engines and cars. A big pick up with an over-sized cylinder eight-engine is going to need something different from a subcompact with an under-sized four-cylinder engine. But does that translate to twenty-something radiator designs or ninety-something? Bloomberg reports Toyota has been thinking about this question for radiators and other car parts (Toyota Airbag Cuts Create Opening for Overseas Suppliers, Jun 10). In the past, Toyota focused on developing custom parts. It needed 50 types of knee-level airbags because seats for various models had different profiles. By standardizing “hip heights,” as the automaker calls it, across models, Toyota says it can reduce knee airbag variants by 80 percent. As of last year, the automaker had slashed radiators to 21 models from about 100, according to Shinichi Sasaki, Toyota’s global purchasing chief. And the company is reducing the number of cylinder sizes in its engines to six from more than 18 by 2016, the Nikkan Kogyo newspaper reported June 4. Toyota declined to comment on the report. “From now on, Toyota will seek the compatibility of certain parts it uses with standard parts used by many automakers globally,” the company said in a statement outlining its Toyota New Global Architecture, or TNGA, in March. Some of the anticipated benefits here are fairly obvious. For example, the article mentions that standardizing parts like radiators that customers don’t care much about (beyond knowing that the car has one) will free up engineering time to work on body or cockpit design that customers do care about. Similarly, many of the implementation challenges (such as standardizing hip height) are fairly clear. Customers may not care about knee-level airbags per se, but standardizing those means standardizing some aspect of the interior design. Customer may or may not notice. Last Monday I posted about Rethink Robotics’ Baxter robot which can be easily programmed to perform a variety of manufacturing tasks. And that very day, the Wall Street Journal had a story about a firm that uses Baxter robot (A Toy Maker Comes Home to the U.S.A., Mar 11)! K’Nex Brands makes a variety of plastic building sets that snap together to make any number of things. Over the last several years, they have moved much of their production from China back to Pennsylvania. 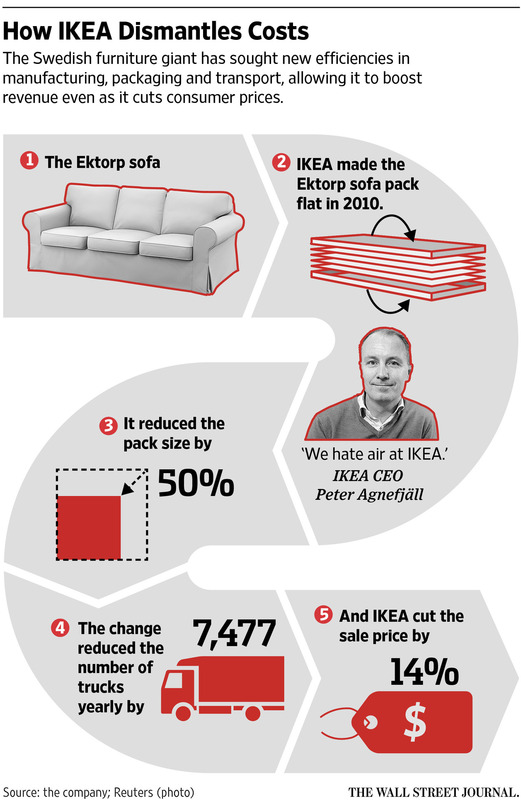 There are a number of strategic reasons for the move. Robotics play a roll in this. They use the Baxter for “simple packaging tasks,” which sounds like the kind of thing that it would be impossible to have a human do more cost effectively in the US than in Asia. When I was a kid, I loved Legos. So I was, of course, pleased when my kids started playing with them. In the last year or so, my kids have outgrown them. And while having all the Legos put away makes it a little safer to walk barefoot across the family room, it does make me a litte sad. Which is why, I guess, I have a soft spot for stories about Legos. Like, for example, a BBC story asking just how many Legos can you stack on top of each other (How tall can a Lego tower get?, Dec 3). Turns out, you can make a pretty tall tower. Ian Johnston and the team do two more tests to be sure we hadn’t just happened upon the strongest Lego brick in existence. And in fact they were impressed at the consistency of Lego manufacture. The average maximum force the bricks can stand is 4,240N. That’s equivalent to a mass of 432kg (950lbs). If you divide that by the mass of a single brick, which is 1.152g, then you get the grand total of bricks a single piece of Lego could support: 375,000. So, 375,000 bricks towering 3.5km (2.17 miles) high is what it would take to break a Lego brick. Here’s a graphic to help visualize 375,000 Lego bricks. We’ve got two stories today that illustrate ways of taking cost out of building cars but they come from very different parts of the auto market. One is about making high-volume, low-cost cars at Renault. The other is about high-end, low-volume electric cars from Tesla. 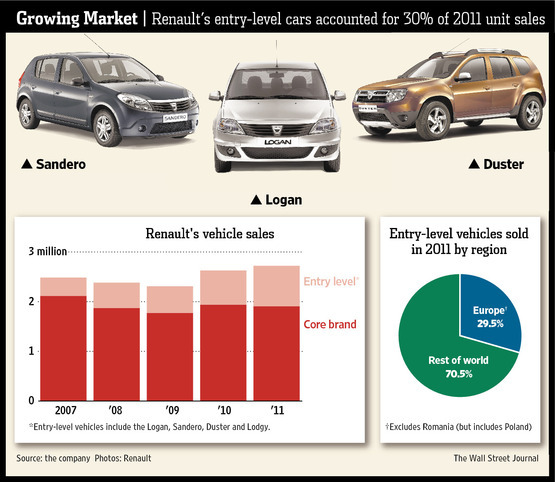 The Renault story comes from the Wall Street Journal (Renault Takes Low-Cost Lead, Apr 16). Renault launched a low-cost model called the Logan in 2004 with the intention of selling it in developing markets but subsequently expanded its entry-level offerings (see the graphic) and started selling them in Western Europe. They now account for 30% of Renault’s sales and supposedly sport a profit margin more than double the margins on the rest of Renault’s line.